Operational since September 2011, OEMO now has a website. gathered together experts from the Mediterranean basin and is now the de facto voice of civil society in that region. Its prerogatives include linking economic change with social and living conditions, thinking about projects and future challenges (especially regarding young people), strengthening the prospects for balanced territorial development and also carrying out systematic comparisons of the area with other parts of the world to place itself in a stronger position. All this as part of its mission to reinforce the regional perspective. The independence of the OCEMO enables it to be proactive on the topics of youth, training, business creation, employment and economic development. From networking activities to creating a communication channel for partner members for incubating projects, the OCEMO has a wide-ranging scope of intervention. As a network of economic networks, the Office may also act as project coordinator. Based in Marseille and co-chaired by Philippe de Fontaine Vive (Vice-President of the European Investment Bank) and Kemal Derviş (President and Director of Global Economy and Development, Brookings), this think-tank extends over the forty-three countries of the Union for the Mediterranean (UfM) and the Gulf countries. The new association is therefore continuing its development on the Web to make its initiatives more visible and legible. 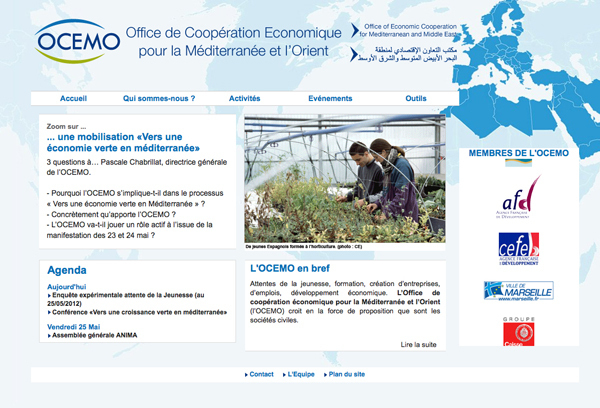 The website will serve as a link to the OCEMO, presenting its initiatives and activities. It will house OCEMO’s work and a calendar of major events for both OCEMO and its twenty-three members, which it brings together for more effective action. Internet users can also read OCEMO Briefings and Newsletters, reports of events and project monitoring.